Texas Organizing Project Deputy Director Brianna Brown rallies supporters at the launch of the paid sick leave petition drive. In Texas, 40 percent of workers don't have access to paid sick leave, according to the Institute for Women’s Policy Research. That’s true for half of all Hispanic workers in the state. This fall, Dallas voters may have the chance to weigh in on whether workers across the city get paid when they’re too sick to work. A coalition of community groups, faith leaders and unions launched a campaign Friday to put a paid sick leave ordinance on the November ballot. To do that, they’ll need to gather nearly 65,000 signatures on a petition by mid-July. Under the proposed policy, everyone who works in Dallas would earn an hour of paid sick leave for every 30 hours they work, up to six or eight days a year, depending on the size of the business. 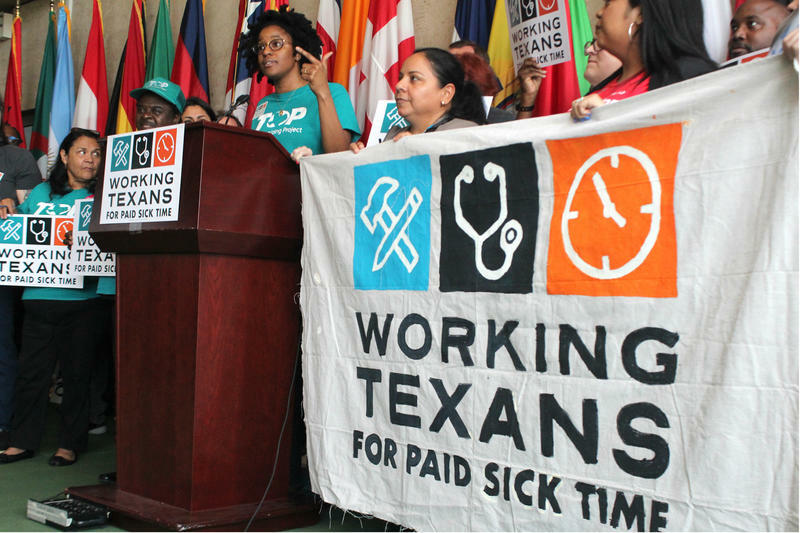 Earlier this year, Austin became the first city in Texas to mandate paid sick leave. In San Antonio, advocates have also launched a ballot initiative. The policies may face a challenge in the Legislature next year, though. Some Republican lawmakers have already pledged to bring a bill to functionally overturn local sick leave requirements. That's why Dallas City Council member Philip Kingston says they're using the petition process instead of introducing an ordinance in City Council, which would be a lot easier. "What we need to do is demonstrate to the legislators in Austin that this is what the people want," Kingston said.